INPUT FROM ODIAPORTAL.IN: Board of Secondary Education, Odisha -- has published Instruction Manual for filling-up online application for Enrollment of Class - IX students for -- Annual HSC (Matric) Exam 2018. The process of online registration of 9th Enrollment will start from 09/09/2016 till 02/10/2016 11.45 pm. 1. The authority to Log In shall be the Head of the Institutions. 2. The online registration shall be done (24 x 7) on visiting the website www.bseodisha.ac.in from 09/09/2016 till 02/10/2016 11.45 pm. 3. The payment of fee shall be closed by 01/10/2016 and the schools who have made payment at the last moment can submit their application till 02/10/2016 midnight. 4. Head of the Institutions shall Log In by entering their respective school code and password. 5. The password shall be the same by which they filled up application forms for Annual HSC Examination-2016. 6. The Schools who have not created their passwords are to login by the Password, “[email protected]” and change the Password immediately. 7. The Schools under Jeypore Zone have been given new school code and their Password will be “[email protected]” and they shall change the Password immediately. Here the following fields have to be filled in. 1. Click check box to proceed for payment and Click “Proceed” button. 2. Select State Corporate/ Institution as “Odisha” and Type of Corporate/ Institution as “Educational Institution” & Click "GO" to move to next Page. 4. Select Payment category as, “Enrollment Fee for HSC Examination-2018". 6. The total no. of students and amount of fee shall be entered as calculated earlier. 8. Information you have entered will be shown on the screen. Click “Confirm” to go for payment, if the entered data is correct or go back to correct the wrong information entered. 9. Now payment can be made either through ONLINE/OFFLINE mode. ONLINE payment can be made through SBI ATM cards/ Net Banking and OFFLINE Payment can be made through generation of Challan by the Bank. 10. After the Payment is made, Logout and wait for at best 12 hrs to make the Server authenticate the DU reference number, generated on Payment of Fee. 2. At first School Profile has to be filled in. 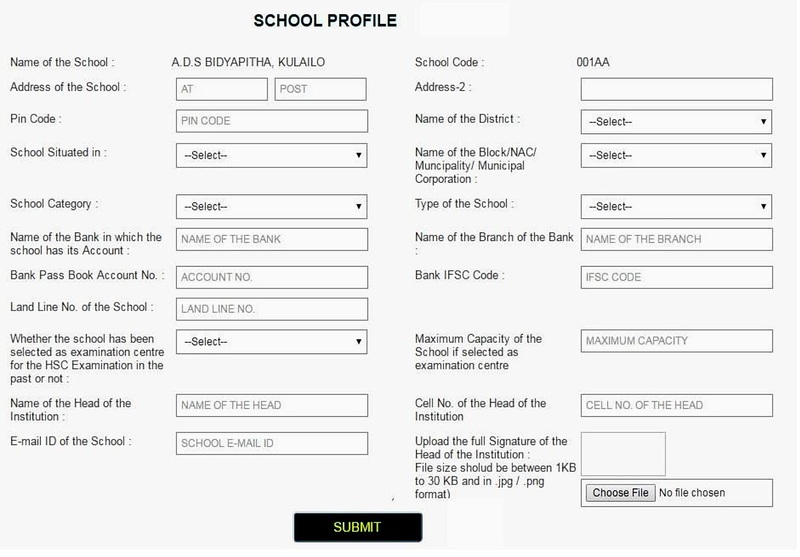 Full signature of the Head of institution has to be uploaded. 3. All information relating to schools shall be filled up correctly. 4. Click “SUBMIT” button and move to the STUDENT REGISTRATION Page to register the students one by one. 5. Keep the scanned copy of photos & full signature of all students ready before going for registration. Scanned images should have to be saved by their names, so that same shall not be interchanged. 6. While filling up the registration form of the candidate, the Head of the Institution should fill up all information correctly, particularly the Name, Father/Mother Name & DOB. 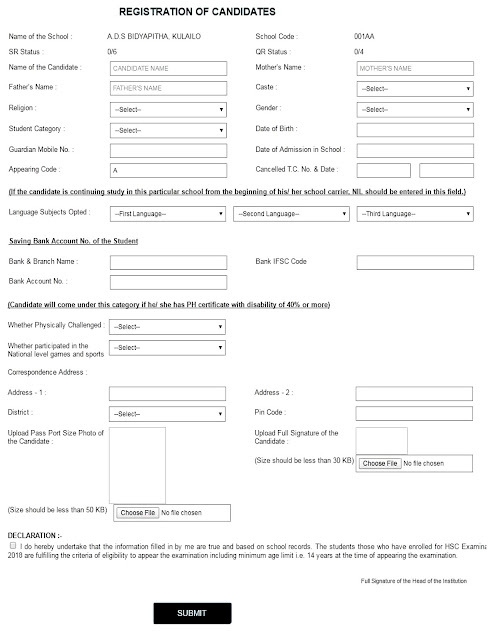 The 1st, 2nd & 3rd language subjects shall have to be selected correctly from the drop-down failing which, the student will not get customized OMR Answer sheet in the Examination. 7. In case 1st language of the candidate is other than FLO, an extra field will be shown i.e MTH, GSC & SSC. This field refers to medium of language for appearing in other subjects i.e MTH, GSC & SSC which has to be selected correctly. 8. Photo & full signature of the student in proper file & size have to be uploaded for avoiding any complicity in future. 9. The Vocational Trades have been introduced in 208 schools from 2016-2017 in Class X. The students of these schools can choose any one trade from two trades opened in each school in lieu of third language subject. One of these trades can be opted in place of third language subject in the designated 208 sheets. 11. After entering all fields, the entered information has to be again checked / edited before Clicking “SUBMIT” button. 12. You can fill up application forms one after another of those number of students, for which enrollment fee has been deposited. 13. In case you require to enroll more number of students, enrollment fee of those students have to be deposited in the online application, so that software will allow you to enroll the students. 14. After completion of all registration, you can click on “Registered list of Students” to visualize the entire registration done by you. 15. This time you are being given another chance to view & edit the information submitted by you. Therefore you are once again allowed to edit the data of students. 16. After completion of edit and when you are doubly sure that, all information entered are correct, Click on “Final Submit” button. After doing this nothing can be edited and you will be directed to download your “Descriptive Roll” (DR). 17. After completion of enrollment of a particular phase, you can download DR of those students. You can do the enrollment as many times, however it is advised to do the same once. If you have any query regarding Online Apply, please contact us via comment box below. we will help you as soon as possible.